MYOB listed on the stock exchange in May 2015 at a commanding 2 Billion dollar price tag! If there was ever a question about precisely how valuable this accounting software company was, the share market debut confirmed it. MYOB is still the big daddy of accounting software in Australia, and we have already written a previous review of different accounting software options here. So what is our opinion of MYOB now it is a listed company? Well business as usual. There are over 2 million small businesses in Australia so there remains a big opportunity for MYOB to expand. Of course it cuts both ways. MYOB’s existing dominant market share presents a delicious target for their main competitors, Xero and Quickbooks. 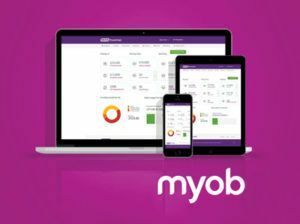 To combat this, MYOB is making a big move into a comprehensive cloud-based accounting software offering. This is in contrast to their traditional desktop driven software. While ‘cloud’ presents a natural opportunity (and cost saving over time), the first mover in this cloud space is undoubtedly MYOB’s nemesis …Xero. Xero’s tagline is “beautiful accounting”. While beautiful is probably not the first ‘thought bubble’ people might relate accounting software to, we’ve got to say Xero’s product is pretty amazing. The fact Xero built their software in the cloud from day 1, with no legacy issues (unlike MYOB with desktop versions needing to sync with the cloud) means Xero have achieved their ‘beautiful’ goal in many ways. Nothing is ever perfect though. Xero’s inventory module gets a bit of negative stick from some users, in comparison to say MYOB which has a much more robust solution for firms that carry decent levels of inventory/stock. Xero have created quite the cult following in the micro business segment – so watch this space. In fact, Monarch will be offering Xero as an alternative to MYOB in 2015 for all its’ bookkeeping and accounting courses.